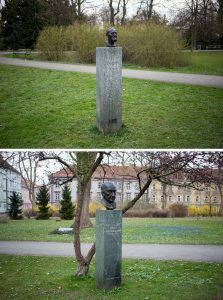 I was walking through Stadtpark in Graz, and met a lot of sculptures of famous Austrian cultural figures. I decided to replace two sculptures and observe the reaction of the citizens. During the month, the sculptures were on different pedestals and no one noticed the substitution.